There are a lot of cheap mics on the scene and not all of them are created equal. One that does stand out, though, is the Audio-Technica AT2020. This microphone is a general purpose, low budget microphone that – for the most part – stands out from the crowd in the best way possible. 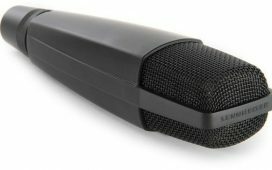 In this article, we are going to look at what makes the Audio-Technica AT2020 a microphone to watch out for. 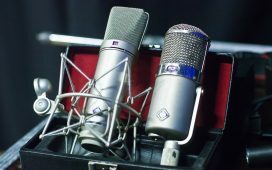 The Audio-Technica AT2020 is a microphone that is 6.38 inches in length (or 162 mm), 2.05 inches in diameter (or 52 mm), and weighs in at a total of 12.1 ounces (or 345 grams). This makes the design of the microphone lightweight and compact, making it easy to use anywhere. 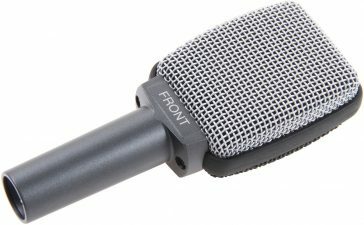 Another notable design feature is the housing on this microphone. 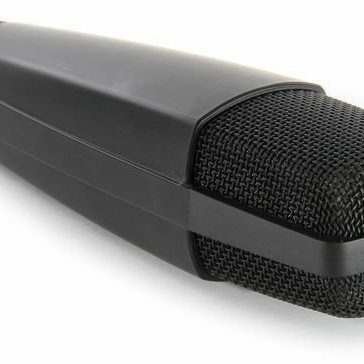 Most cheaper mics use a simple, plastic housing which can be easily damaged or broken. 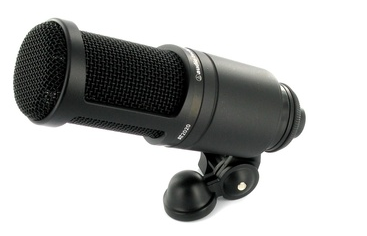 The Audio-Technica AT2020, however, is made with a cast metal housing, making it more durable and longer-lasting than its competition. The final design feature that we want to point out is the cardioid pickup pattern. This specific pickup pattern allows the microphone to pick up the sounds right in front of it but not beside or behind it. This allows you to isolate noises that you don’t want recorded. Dimensions of 6.38” (or 162 mm) in length, 2.05” (52 mm) in diameter, and 12.1 ounces (345 grams) in weight. USB port allows for digital recording. 48V phantom power sources (must be bought separately). Maximum SPL rating of 144 dB. 20 Hz – 20 kHz frequency response, allowing for it to perform on par with an average large diaphragm condenser although it is a medium diaphragm microphone itself. The Audio-Technica AT2020 offers a fairly clear and flat response to most of what it records. The frequency response is 20 Hz to 20 kHz, covering low-, mid-, and high-range sounds with little to no difference in clarity. This mic does have some problems with self-noise but they won’t cause too many issues unless self-noise is a major deal breaker for you. The Audio-Technica AT2020 also uses a cardioid pickup pattern. 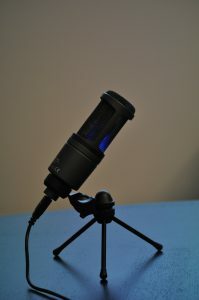 This means that you can record directly in front of the mic and it won’t pick up sounds behind or on either side of it. 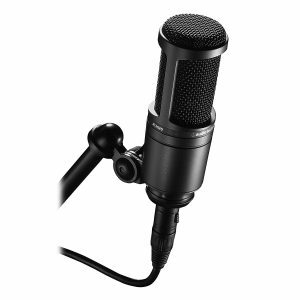 However, you do need to be fairly close to the microphone for it to pick up what you are trying to record. The Audio-Technica AT2020 is fairly easy to use. It doesn’t require a lot of post-recording editing to make it sound professional and the setup is fairly easy. For the most part, even a beginner would have an easy time with this microphone. Clear reproduction of sound, allowing for a professional sound without the price tag of higher end microphones. As mentioned, this microphone doesn’t have the price tag of other major brand microphones. 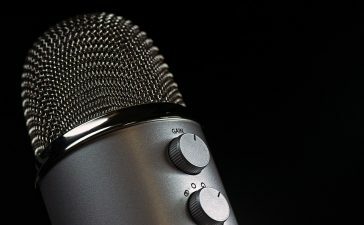 This allows for recorders with a lower budget to get their hands on the Audio-Technica AT2020 and still have a quality piece of recording equipment to use without the price tag of a higher branded microphone. 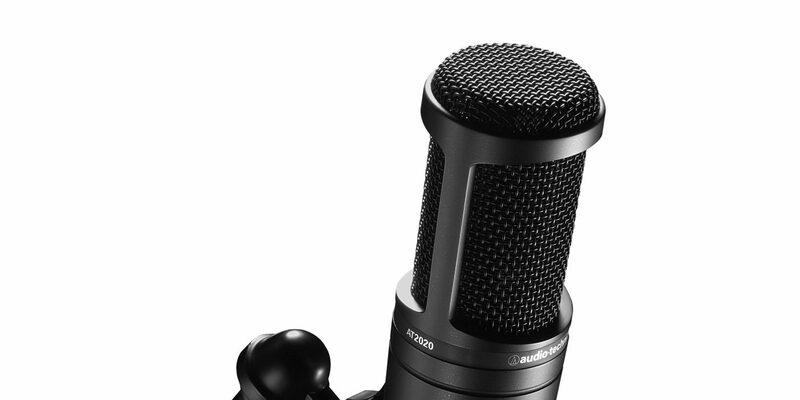 Rather than the plastic construction of some cheap microphones, the Audio-Technica AT2020 is built with a cast metal housing, so it is more durable than other options in its price range. For the most part, the Audio-Technica AT2020 offers a fairly flat sound. This means that you won’t hear a boom in your vocals or sibilance in recording sounds such as an acoustic guitar. The dimensions of the Audio-Technica AT2020 is a length of 6.38 inches (or 162 mm), a diameter of 2.05 inches (or 52 mm), and a weight of 12.1 ounces (or 345 grams). This makes it an extremely compact choice that you can use almost anywhere. 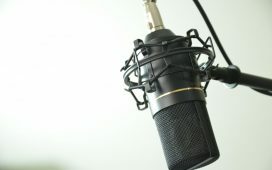 The Audio-Technica AT2020 has a good range on it, so you won’t notice a difference in quality when you are recording low-pitched sounds (such as a male voice) or high-pitched sounds (such as a female voice). Available for sale with a USB output to be used in digital recording. The Audio-Technica AT2020 has a headphone jack with a volume control, allowing you to listen to the audio input as it happens with no delay. A mix control feature allows for you to blend microphone signal and pre-recorded audio without a problem. The Audio-Technica AT2020 has a high-output internal headphone amplifier which allows for fantastic clarity and a general volume boost as well. The maximum sound pressure level (or SPL) of the Audio-Technica AT2020 is 144 dB. This means it can reproduce louder sounds – such as loud instruments or strong vocals – without the clarity being disturbed. This microphone uses a cardioid pickup pattern, which means that it won’t pick up unwanted sounds around or behind it – just what is said or played directly in front of it. The Audio-Technica AT2020 is limited by its lack of a Polar Pattern Selection switch or attenuation pad. The lack of a pattern switch and roll-off filter is fine with recording sounds such as an acoustic guitar or vocal performance but otherwise its usefulness is limited. This microphone comes with a lot of different accessories. However, what it is lacking is a mount. So, to use this microphone properly, you will have to buy a shock mount separately. This mic has some issues with self-noise. 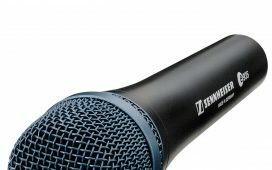 For the most part, this isn’t an issue but if you are looking specifically for a mic that produces low self-noise, this might not be the one for you. The source of sound needs to be close to the microphone for it to be recorded properly, so it won’t pick you up if you are further away from the mic. The Audio-Technica AT2020 does require a phantom power supply that has to be bought separately from the microphone itself. 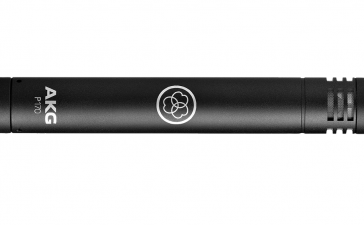 Overall, the Audio-Technica AT2020 is a budget-friendly, professional quality microphone. It doesn’t break the bank but it doesn’t compromise on quality either. It offers superb sound quality and durability and is, all in all, one of the best choices for a recording mic for the pro or the beginner.